A class specifically designed for those who are new to yoga. The class introduces the common foundational asanas (postures) and sequences found in flow yoga with a strong emphasis on alignment and breath. Paced to suit beginners, it provides a strong base from which to grow and deepen your yoga practice. More experienced yogis are very welcome – the class provides a good opportunity to review the basics. 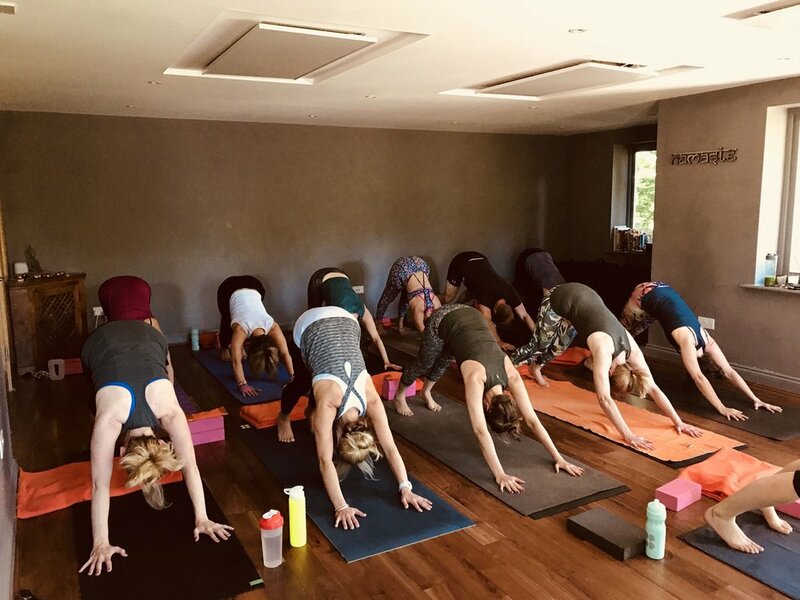 A non-heated vinyasa yoga class, with a flowing sequence of postures that work every part of your body and challenge you mentally and physically. Suitable for all levels, this class helps build strength and flexibility in both body and mind. A strong flowing vinyasa yoga class in a room heated to 28-30 degrees. The warmth allows muscles to stretch safely, supports joint mobility and to encourages the body to sweat and detoxify. This class is not suitable for beginners. A slower flow for those wanting something a bit more mellow in their yoga practice. The focus here is on gentle, mindful movement and easeful transitions between postures (if you're looking for lots of chaturangas then this isn't the class for you!). Ideal if you're recovering from injury or just need to slow things down and take things easy. A bit of both flow and a bit of restorative - you could say the best of both worlds! We warm up with 30 mins of gentle yoga flow followed by 30 mins of restorative yoga to replenish, rejuvenate and restore. This energetic class focuses predominantly on static yoga postures with one or two short flows included in some sequences. The class is suitable for beginners to yoga, and also includes progressive postures for those ready to step up their practice. The class is themed each month, allowing students to observe and celebrate their progress week on week. A deeply relaxing practice, the intention is to lead students into a deep state of relaxation. Suitable for all levels, the class will be slow paced, focussing on moving slowly into postures and being fully supported by props. The shapes are held for between 3-5 minutes to allow a conscious releasing of muscular tension and activation of the body's multiple relaxation systems and responses. A beautiful yoga class for everyone. Yin yoga targets the connective tissues (such as the ligaments, bones, and even the joints) that are not normally exercised very much in a more active style of asana practice. Suitable for almost all levels of student, it's a perfect complement to the more dynamic (yang) styles of yoga. Although powerful it is a healing, calming, and meditative practice using the breath to ease into mostly seated poses which are held for time (typically around 5+ mins) in stillness.